DOW Driving Habits - General Discussion - Drive On Wood! Bummer! no bills in the mailbox. Hi Wayne looks like the horse gets along with the cows, and you have a lot of younger cows. Were back intoo cold as ice up here in michigan, sure makes the wood pile look good & safe.I enjoyed the nice snow thaw we had for few extra days. Well you might have to trough in some of that warmer weather to boot. Thank you Wayne, that was a great drive with you. Hearing what you are looking at and thinking while you are going down the road was amazing, what a leaning experience for me. I’m sure others will picking up on the words of wisdom and knowledge you have while DOW. Very helpful indeed. It is never a boring ride when we can learn something new with one and other while DOW. The view and country sideside was just a great big plus. wonderful drive even in the rain. I did not know you have moose in your country. Do you have elk Also? Yes, we have quite a lot of moose. One of my neighbors actually smashed into one only 200 yards from this one two weeks ago. He was lucky to have slowed down prior to disvovering it. Still the moose ended up through his windscreen. Reindeer country starts right north of me and I don’t risk hitting them unless I travel 100 miles or more further north. I was under the impression moose and elk was the same. I realise now I probably never seen what you call elk in real life.
" Is it an elk? Is it a moose? If you’re in Sweden, the answer is “BOTH”! The iconic, majestic forest dweller Alces alces is known as a moose in North America (actually the sub-species Alces alces americana) and an elk in Europe. 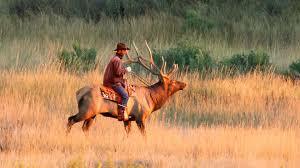 The word elk, like the Swedish word älg (pronounced /elj/), is taken from the Latin alces. 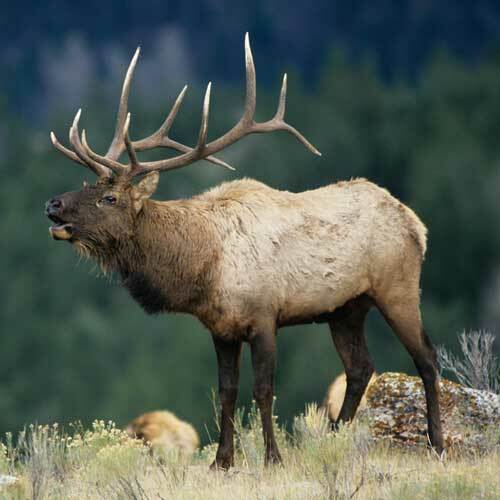 To make matters even more confusing, elk in North America is used for an entirely different animal – a kind of deer, Cervus elaphus, otherwise known as a Wapiti "
OK, I’ll take your word for it, professor. Once in a while we see Moose, but this what we see the the mountains around us the elk, and also deer. Most of the cowboys in the U.S.A. ride horses, but in the State of Montana there is a different breed of cowboy. This is a Canadian Mounty checking the boarder for illegal Americans crossing. Hey wait a minute, that’s a Washington State Patrolman uniform. We’ve got small deer but investigating things further it seems your elk exists only in North America and Eastern Asia. We have elk too. Not as big as the one that cowboy (or shuld l say elkboy ) is riding but still a majestic beast. No moose thugh. Deer is common. Allso wild boar population is expanding. I thought there are Red deer in Europe in some parts, which are essentially elk? Yep google says our elk is same as your red deer. Up to 300kg while our deer grows up to 35kg. Rabbit running good, no shortage of available food around your farm, that moose act like he was in no hurry too run from the rabbit. Amazing. Similar size variation occurs here, a buck white tail deer in the north might weigh 180lbs, but in Mexico they are the size of a dog. But still perfectly proportioned, tiny little 5 point antlers, looks comical. Here a bull elk may just break a barb wire fence with his antlers so he doesn’t have to hop over it, only moose are bigger.